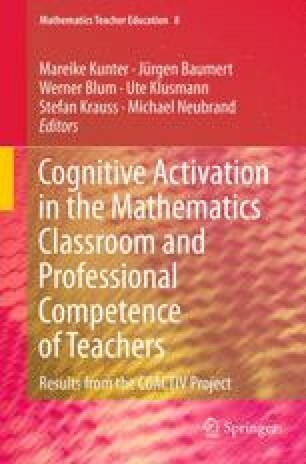 This chapter addresses teachers’ motivational characteristics as an aspect of their professional competence. It begins with a theoretical overview of motivation as an aspect of professional competence and of research findings on teacher motivation. Research findings from COACTIV with a focus on teachers’ enthusiasm are then reported. Teacher enthusiasm is an intrinsic motivational disposition that is assumed to be a central factor in determining teachers’ professional success. In COACTIV, we distinguish between teachers’ enthusiasm for their subject and enthusiasm for the activity of teaching. Our findings show that both aspects vary between teachers and that enthusiasm can change over time. Moreover, our results indicate that teachers’ enthusiasm for teaching, but not their enthusiasm for the subject, influences their instructional quality and, in turn, their students’ achievement and motivation. The chapter concludes with a review of the current state of knowledge and an outlook on future research questions and their practical implications.